Central Park Boathouse wedding pictures are simply the best, the end. Where else in Manhattan can you have an amazing ceremony location, perfect cocktail hour space, stellar reception location, AND be able to take brilliant wedding day portraits right in the venue’s backyard? Nowhere else other than the Loeb Boathouse in Central Park! If you have not checked out this spectacular venue for your Manhattan wedding, I highly suggest that you do so! The Central Park Boathouse is a very versatile venue, offering up indoor and outdoor locations to the discerning Manhattan bride. If I were searching for "Best Manhattan wedding venues", I know that Loeb Boathouse would pop up in almost all searches. The best word to describe this idyllic venue is iconic. 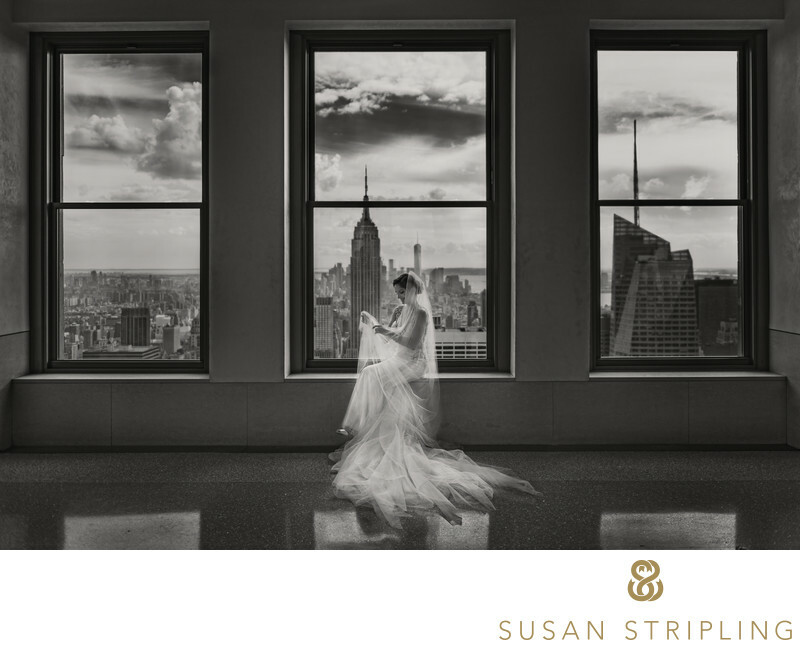 I can think of few venues that truly embody the iconic New York feel that many Manhattan brides and grooms desire. One of the questions that I get asked a lot is "What happens if it rains during my Manhattan wedding?" As a wedding photographer in the city, this is a question that I dread. There is usually no great answer. Many venues with outside spaces don’t have an abundance of indoor space to use as a rain plan. At best, the indoor locations are boring but huge. At worse, they’re small and difficult to maneuver in. Lots of venues do have great indoor and outdoor locations, such as Tribeca Rooftop, the New York Palace, and the Bowery Hotel. It can also be difficult to obtain a permit or permission to shoot indoors. Many venues won't allow you to take wedding day pictures there unless you're getting married there. Many hotels, even if you're staying there for your wedding, will not permit you to shoot wedding pictures in their lobbies or other public places. For this reason, it can be really difficult to create a rain plan for Manhattan wedding day portraits. While the rain plan for portraits at the Central Park Boathouse isn’t attached to the building, it’s within walking distance. Just grab some umbrellas and we’ll be there in less than five minutes! The lower passage of Bethesda Terrace is sheltered from the rain, and is absolutely gorgeous. I love that the carvings on the walls illustrate each of the four seasons and the times of day - something I didn’t know until I looked it up! The arches and delicate wall engravings provide a unique backdrop to wedding day portraits. Instantly recognizable as an iconic New York location, yet versatile and charming, this is one of my favorite portrait locations in Manhattan. While it’s spectacular in the rain, peaceful and private, it’s also stunning when the sun is out! At this particular Manhattan wedding, the bride and groom got ready at the Mark Hotel and the New York Palace before heading out to their midday ceremony at St. Bartholomew’s church. After the church ceremony, we took family portraits inside of St. Barts, before heading out onto the city streets for a few images of the bride and groom together. After that, it was time to board the limo and head into Central Park! The wedding party dropped their belongings off at the Central Park Boathouse, and then it was off to Bethesda Fountain for some bridal party portraits. 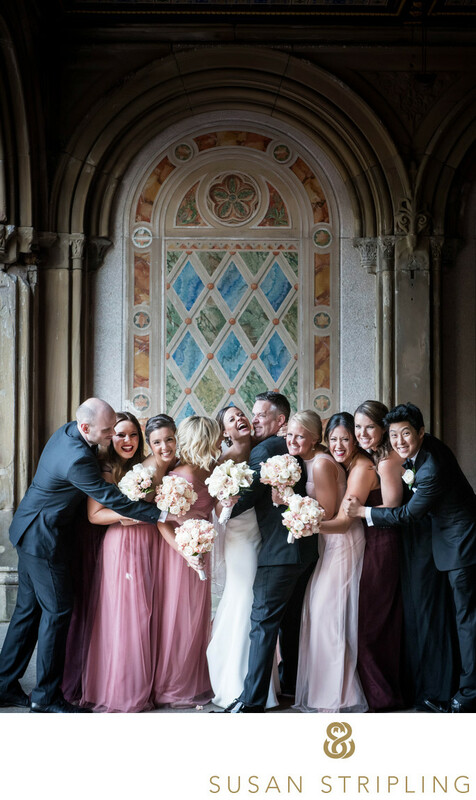 Portraits at Bethesda Fountain were not enough for this vibrant, close-knit bridal party. I knew that I wanted more documentary images of this fantastic group together, but I didn’t want to take all of the portraits in the same location. We moved to the passages under Bethesda Terrace for a few more images of everyone together. I wish you had been there to see the bouquet mishap when Rob Adams of Rob Adams Films had the bridal party toss their bouquets in the air! One of the bridesmaids tossed, but didn’t catch, and her bouquet exploded all over the ground! This group was totally unfazed, finding it utterly hilarious instead of upsetting! When creating this portrait, I just asked the whole group to give each other a group hug. I’d placed them in beautiful light and a great compositional scenario, leaving me to just watching while the hilarity unfolded. I truly love watching people being themselves on the wedding day, and the face of each member of the bridal party is fantastically perfect. I could set up stylized images, with each member of the bridal party in a fashion-based pose, looking in different directions. That really isn’t my style, because that doesn’t show off the personalities of each member of the bridal party. I prefer to use the environment around me as well as the relationships of the people to create my portraits. This was a group-hug sort of group, but other bridal parties might not be. Some might be quieter, some even more exuberant. At each wedding, I strive to create bridal party portraits that reflect the spirit of that unique group of people. 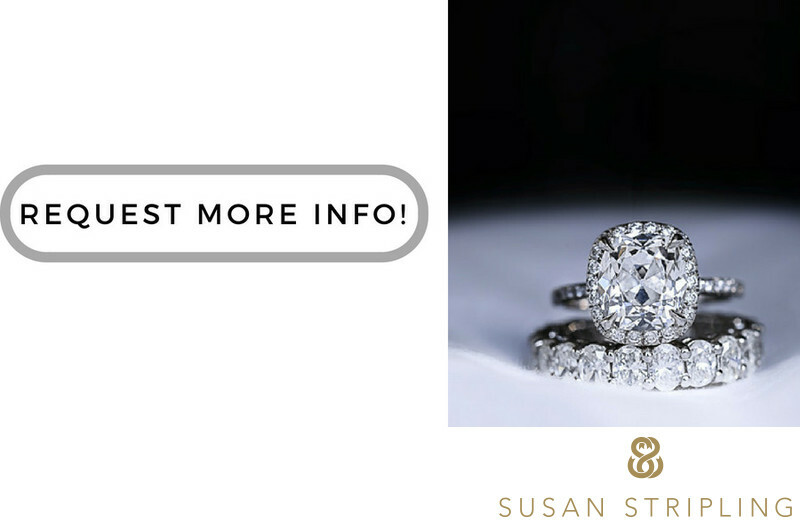 If you're getting married I'd love to talk to you about your wedding photography! Location: 72 Terrace Dr, New York, NY 10021. 1/160; f/5.6; ISO 2200; 62.0 mm.